Located in the plaza on the corner of Elmwood and Madison, Ice Cream Joy is well-known for its vegan friendly ice cream flavors and artisanal flavors as well. In their little storefront, they feature local artist’s work. While there is plenty of two-dimensional art to choose from, if you purchase a handmade bowl, you get a free complimentary single scoop at the time of purchase. Every time you bring the bowl back, you get fifty cents off of your scoop of ice cream. 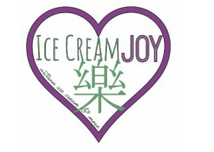 At Ice Cream Joy, the employees care about the environment and the world we live in. While construction of this ice cream shop was going down, they decided to do everything as an earth friendly option. Instead of central air, they inserted a fan. Instead of wasting cups when a customer would like water, they put in a water fountain. Also, when it came to buying furniture for the shop, they purchased gently used chairs and tables from local residents and local Cleveland companies and then refurbished and repaired them. As a vegan friendly shop, their website consists of most of the ingredients that they use in their vegan ice creams. While the owner and operator Marissa Flynn describes that she never had the intention of making vegan ice creams, she says she’s glad she did! Although it is mainly an ice cream shop, they offer a variety of drinks and brunch options. Ice cream joy is a great option if you are vegan or vegetarian or even if you’re not. They also happen to make a wonderful chocolate chip cookie waffle cone!